Activate your weight-loss autopilot—use the power of simple intermittent fasting to lose the pounds and keep them off, from Hollywood trainer and #1 New York Times bestselling author Jorge Cruise. 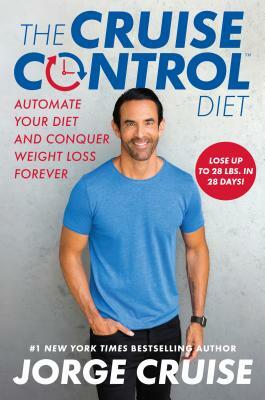 With The Cruise Control Diet you’ll automate your diet and finally conquer weight loss forever! Featuring a foreword by Brooke Burke and an introduction by Jason Fung, M.D. Jorge Cruise is the #1 New York Times bestselling author of more than thirty titles with more than eight million books in print, including 8 Minutes in the Morning, The Belly Fat Cure, and The 100. Internationally recognized as a leading fitness trainer, Cruise has transformed the lives of millions of people, including Angelina Jolie, Jennifer Lopez, Khloe Kardashian, Steve Harvey, Miley Cyrus, Tyra Banks, 50 Cent, and Eva Longoria. A graduate of the University of California, San Diego, Cruise also has training certificates from the Cooper Institute for Aerobics Research, the American College of Sports Medicine (ACSM), and the American Council on Exercise (ACE). A frequent contributor to The Steve Harvey Show, The Dr. Oz Show, Good Morning America, Today, The Rachael Ray Show, HuffPost, Extra, First for Women, AARP Magazine, and The Costco Connection, he also hosts the Jorge Cruise Show on Facebook Watch, as well as The Cruise Control podcast. He lives in Malibu, California.